Museums and iterative agility: do your ideas get oxygen? Re-visiting the results of the survey I ran about issues facing museum technologists has inspired me to gather together some great pieces I’ve read on museum projects moving away from detailed up-front briefs and specifications toward iterative and/or agile development. I’d also recommend the presentation ‘Play at Work: Applying Agile Methods to Museum Website Development‘ given at the 2010 Museum Computer Network Conference by Dana Mitroff Silvers and Alon Salant for examples of how user stories were used to identify requirements and prioritise development, and for an insight into how games can be used to get everyone working in an agile way. If their presentation inspires you, you can find games you can play with people to help everyone understand various agile, scrum and other project management techniques and approaches at tastycupcakes.com. I’m really excited by these examples, as I’m probably not alone in worrying about the mis-match between industry-standard technology project management methods and museum processes. In a ‘lunchtime manifesto‘ written in early 2009, I hoped the sector would be able to ‘figure out agile project structures that funders and bid writers can also understand and buy into’ – maybe we’re finally at that point. “1. The nature of the user experience problems are typically too complex and nuanced to be articulated explicitly in a brief. Because of that, good user experience work requires ongoing collaboration with the client. Ideally, client and agency basically work as one big team. Source: The Pernicious Effects of Advertising and Marketing Agencies Trying To Deliver User Experience Design*. “Usage is like oxygen for ideas. You can never fully anticipate how an audience is going to react to something you’ve created until it’s out there. That means every moment you’re working on something without it being in the public it’s actually dying, deprived of the oxygen of the real world. By shipping early and often you have the unique competitive advantage of hearing from real people what they think of your work, which in best case helps you anticipate market direction, and in worst case gives you a few people rooting for you that you can email when your team pivots to a new idea. Nothing can recreate the crucible of real usage. * The Merholz article above is great because you can play a fun game with the paragraph below – in your museum, what job titles would you put in place of ‘art director’ and ‘copywriter’? Answers in a comment, if you dare! I think it feels particularly relevant because of the number of survey responses that suggested museums still aren’t very good at applying the expertise of their museum technologists. If you liked this post, you may also be interested in Confluence on digital channels; technologists and organisational change? (29 September 2012) and A call for agile museum projects (a lunchtime manifesto) (10 March 2009). Posted on 21st November 2010 24th January 2016 Categories UncategorisedTags agile, best practice, cultural heritage sector, development models, innovation, intelligent failure, iteration, manifesto, organisational resistance, project management4 Comments on Museums and iterative agility: do your ideas get oxygen? In August 2010 I asked museum technologists to take a survey designed to help me understand and communicate the challenges faced by other museum technologists (as reported in ‘What would you change about your workplace? A survey for museum technologists‘, and as promised, I’m sharing the results (a little later than intended, but various galleries and my dissertation have been keeping me busy). There were 79 responses in total, (49 complete responses, the rest were partial). According to SurveyGizmo’s reporting the survey had responses from 10 countries. The vast majority were from the UK (36%) and the US (49%), possibly reflecting the UK and US focus of the email lists where I publicised the survey. Respondents were based in a wide range of art, history, science, local authority/government, university and specialist museums (in almost any combination you can think of) and had a variety of roles, including content, technical, project managers and managerial titles. As reported originally, for the purposes of the survey I defined ‘museum technologist’ as someone who has expertise and/or significant experience in the museum sector and with the application or development of new technologies. I’ve done my own coding work on the results, which I could also share, but I suspect there’s more value in the raw results. I’m also sharing the results to the first two questions as CSV files (compatible with most applications) so you can download and analyse the data: CSV: As a museum technologist, what are the three most frustrating things about your job?, CSV: List any solutions for each of the problems you listed above. Please note that the data in these files is alphabetised by row, so you should not correlate responses by row number. My thanks to the people who took the time to respond – I hope there’s some value for you in this sampling of the challenges and joys of digital work in museums. I’d love to hear from you if you use the results, either in a comment or via email. Question 1: As a museum technologist, what are the three most frustrating things about your job? Becoming impossible to do new work AND maintain existing sites. IT department not implementing effective change management and training. The decentralized culture of our Museum. Each department is doing their own thing, which makes it difficult to access needs, plan for improvements, allocate resources and staff efficiently. The organizational structure of the museum. The IT Department should be for networking, desktop support and infrastructure but instead they end up being the ones who call the shots about applications and systems. Integrating our technologies and ideas into the museum’s IT infrastructure e.g. wireless hubs, installing software, updating software etc. Too many tasks seen as top-priority without enough support to get them done. Lack of understanding in the wider museum of the work that we do and the potentials of technologies in learning. People in museum administration often know less about technologies than their counterpart in the private sector. Never knowing what others departments are doing, but still being expected to “fix” whatever when it goes down. The little commitment others (even people asked/hired to do so) have towards social media, even after tons of workshops. Funding is spread unevenly. New galleries might come with big pots of money but it’s much harder to fund work on existing sites and sections. Bending commercial products to our own needs. Conflicting messages about the purpose of online – is it to generate income or provide access? Curators/educators living in the dark ages! Hard to sell technology (APIs, etc) to staff who just want their event on the homepage. Trying to get other colleagues involved in technology! Irrational fear of open source; irrational fears concerning access to collection information and even low-res images. Circumnavigating IT when they sya can’t do and supporting it all ourselves. Strict procedures and continuously stressing how things work and how they don’t. solutions that we have found or solutions we wish for? The questions is confusing. We are now submitting a business case to our IT department for us to have access to these sites. Hopefully this will be widened in the future as Council’s become more aware of the essential part technology plays in museums. Having highly-placed technologists who are trusted by the museum involved in projects at an early state can help significantly to teach the institution the value of technological expertise. Look to private sector technology vendors for workflow and project management techniques and tools or hire consultants (voices from outside are often heard louder than those inside). Fix to IT issues that take up so much of my time! Priorities either need coherent justification or to be realigned. Speaking to people to explain the complexity and time necessary for project? Trying to get a pot on our web page for e-learning which displays and advocates our work. Write in the importance of technology projects to accomplishing the mission in strategic planning and grant documents and form interdepartmental teams of people to address technology issues and raise technology’s profile and comfort level within the institutional culture. Show them that colleagues in their field are using the same technology, once they’re willing to listen, show how the results will help them, then make participation as easy as possible for them. If, for every bit of unfounded, unresearched opinion, the technologist can counter with facts about how people actually behave in the world outside the museum, over (large stretches of) time this problem can be gradually allayed. Our institution could benefit from professional training on effective communication, but it’s not in the budget. Be very strict with project deadlines! Developing a Museum Service strategy for everyone to use IT – like V&A have! Informal brown-bag lunches where ideas are pitched and potential explained. Smile, help them, and complain in silence. bringing techies into the development process earlier in a new exhibit etc. Trying to find public outputs of infrastructure-related technology can help with this problem. The way some museums have begun using collections APIs as, in essence, a PR tool, is a good example of this approach. Selected responses to Question 3: Any comments on this survey or on the issues raised? Some comments were about the survey itself (and one comment asked not to be quoted, so I’ve played it safe and not included it) and didn’t seem relevant here. There is still some trepidation and lack of understanding of what it is exactly that digital technology can play in display, interpretation and education programming. Though there are strong peer networks around digital technology, somehow this doesn’t get carried over into further advocacy in the sector in general. In my learning department there is some resistance to the idea of technology being used as a means in itself working across audiences, and it instead has to be tied in to other education officers programmes. The lack of space to experiment and really have some time to develop and explore is also sadly missed as we are understaffed and overstretched. Not enough time, money or staff is true of most museum work, but particularly frustrating when looking at the tools used by the private sector. This imbalance may be part of the source of unreasonable expectations – we’ve all seen fantastic games and websites and expect that level of quality, but museums have 1/1000th of the budget of a video game studio. The interdepartmental nature of many tech projects has challenged us to define under whose purview these projects should be managed. In my organisation I find the lack of awareness and also lack of desire to do things online difficult to comprehend in this day and age. It is not universal, fortunately the Head of Service gets it but other managers don’t. I’m fed up hearing ‘if its online they won’t visit’ and I’m afraid I’ve given up trying to convince them, instead I tend to just work with the people who can see that putting stuff online can encourage visitors and enhance visits for visitors. Being a federal institution, we receive funds for physical infrastructure, but rarely for technical infrastructure. I would say fear around copyright of digitized collections is a barrier as well. Until the culture of an institution of my size changes at the top, it will continue to be a challenge to get anything through in a timely manner. Funding and resources (staff, time, etc.) are the main roadblock to taking full advantage of the technology that’s out there. There needs to be a way to build a proper team within the museum structure and make silos of information available. I think the frustrations I raised are exactly the reason why some of us are in the museum sector – for the challenge. We are fortunate in that we have a very forward-looking Board of Trustees, a visionary CEO and a tech team that truly loves what they do. But we – like any non-profit – are always limited by money and time. We’ve got loads of great ideas and great talent – we just need the means and the time to be able to bring them to fruition! We have actually rewritten job descriptions to make certain things part of people’s everyday workflow and that has helped. Our CEO has also made our technological initiatives (our IVC studios, our online presence, our virtual museum….) part of our strategic plan. So we are extremely fortunate in those respects! I am a content creator, rather than a technie, but as my role is digital, everyone assumes I understand every code language and technological IT issue that there is. And I don’t. One of the largest problems faced by IT staff in museums is the need to push the envelop of technology while working within very limited budgets. There is always a desire to build the newest and best, but a reluctance to staff and budget for the upkeep and eventual use and maintenance of the new systems. That said, working for a museum environment offers more variety and interesting projects than any for-profit job could ever provide. What would Phar Lap do? AKA, what happens when Facebook and museum URIs meet a dead horse? Phar Lap was a famous race horse. After he died (in film-worthy suspicious circumstances), bits of Phar Lap ended up in three different museums – his skin is at Melbourne Museum, his skeleton is at Te Papa in Wellington, NZ, and his heart is in Canberra at the National Museum of Australia. I’ve always been fascinated by the way the public respond to Phar Lap – when I worked at Museum Victoria, the outreach team would regularly get emails written to Phar Lap by people who had seen the film or somehow come across his story. (I was also never quite sure why they thought emailing a dead horse would work). 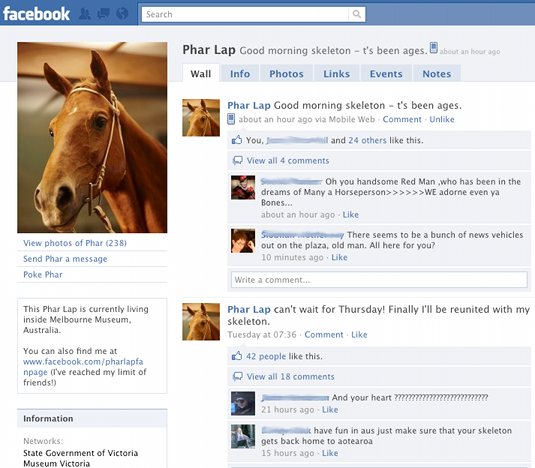 So when I first heard that Phar Lap was on Facebook, I was curious to see which museum would have ‘claimed’ Phar Lap. Does possession of the most charismatic object (the hide) make it easier for Melbourne Museum to step up as the presence of Phar Lap on social media, or were they just the first to be in that space? The issues around ‘ownership’ and right to speak for an iconic object like Phar Lap make a brilliant case study for how museums represent their collections online. And today, when I came across three posts (Responses to “Progress on Museum URIs”, Progress on Museum URIs by @sebastianheath, Identifing Objects in Museum Collections by @ekansa) on movements towards stable museum URIs that problematised the “politics of naming and identifying cultural heritage” and the concept of the “exclusive right of museums to identify their objects”, I thought of Phar Lap. (Which is nice, cos 80 years and one day ago he won the Melbourne Cup). Of the three museums that own bits of the dead horse, which gets to publish the canonical digital record about Phar Lap? I hope the question sounds silly enough to highlight the challenges and opportunities in translating physical models to the digital realm. Of course each museum can publish a record (specifically, mint a URI) about Phar Lap (and I hope they do) but none of the museums could prevent the others from publishing (and hopefully they wouldn’t want to). Or as the various blog posts said, “many agents can assert an identity for an object, with those identities together forming a distributed and diverse commentary on the human past”, and museums need to play their part: “a common identifier promoted by and discoverable at the holding institution will ease the process of recognizing that two or more identifiers refer to the ‘same thing'”. Of course it’s not that simple, and if you’re interested in the questions the museum sector (by which I hopefully don’t only mean me) is grappling with, the museums and the machine-processable web page on Permanent IDs has links to discussions on the MCG list, and I’ve wrestled a bit with how URIs might look at the Science Museum/NMSI (and I need to go back and review the comments left by various generous people). I’d love to know what other museums are planning, and what consumers of the data might need, so that we can come up with a robust common model for museum URIs. Posted on 3rd November 2010 4th February 2015 Categories UncategorisedTags APIs, best practice, collections, cultural heritage sector, digital heritage, digital objects, linked data, metadata, object identifiers, open data, semantic web1 Comment on What would Phar Lap do? AKA, what happens when Facebook and museum URIs meet a dead horse?